Ex-Bosnian Serb leader Radovan Karadzic has had his sentence for genocide and war crimes increased to life in prison. But United Nations appeals judges threw out his request and said his original jail term was too light given the gravity of his crimes and the weight of his responsibility. They extended his sentence to life behind bars. The court said the 40-year sentence did not reflect the trial chamber's analysis on the "gravity and responsibility for the largest and greatest set of crimes ever attributed to a single person at the ICTY". Around 100,000 people died and millions were left homeless during the war which resulted in the collapse of former Yugoslavia. "It's been a very long time coming," said Ivor Roberts, the former British Ambassador to the former Yugoslavia. "It's well over ten years since he was arrested in Belgrade, so the wheels of justice are grinding exceedingly slowly. "There's also his fellow leader of the Bosnian Serbs, Ratko Mladić who was the military commander and I think shares much of the culpability for the atrocities in Srebrenica and elsewhere. "They weren't exactly a team- they were often in extreme conflict- but there's no doubt that Karadzic was one of the great architects of this whole fiasco." 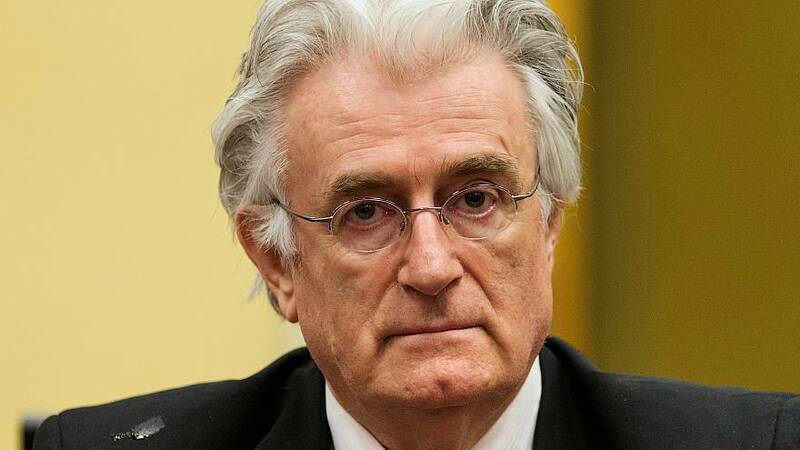 Radovan Karadzic was a former Bosnian Serb politician and convicted war criminal who served as the President of Republika Srpska during the Bosnian War and sought the unification of that entity with Serbia. Trained as a psychiatrist, he co-founded the Serb Democratic Party in Bosnia and Herzegovina. Karadzic went on the run for 12 years after he was initially indicted and was arrested in 2008 in Belgrade, Serbia. Karadzic is sometimes referred to in Western media as the "Butcher of Bosnia"
Roberts negotiated with Karadzic as part of an international mediation effort with the Yugoslav authorities and Bosnian Serbs. "He wasn't a rational negotiator," said Roberts. "You couldn't lay down what your red lines were, or your negotiating positions and expect him to come towards you and meet you in any sort of rational way. "I remember once having a seven-hour negotiating session with him one day, he came to my house and brought with him a map, which he said he couldn't put forward himself for the division of Bosnia into a Serb area and a non-Serb area, but he wouldn't be willing to have it imposed on him. I said well what do you mean, why imposed? And he said well I would be killed if I put this forward as my own plan. I looked at the plan and I knew it was never going to be acceptable to the international community. But it was that sort of unbelievably irrational discussions, that one had time and again with him which were so wearing and so unproductive." What has he been convicted of? In 2016, he was convicted of genocide for the Srebrenica massacre, which saw more than 8,000 Muslim men and boys killed by Bosnian-Serb forces in July 1995. He was sentenced to 40 years in prison as the 73-year-old was also found guilty of war crimes and crimes against humanity. Prosecutors are seeking a life sentence and a second genocide conviction for his alleged role in a policy of targeting non-Serbs across Bosnia in the early years of the war. What are his lawyers saying? He and his lawyers said prosecutors unfairly blackened his name and that Karadzic's words were twisted during the seven-year trial. What do he and his lawyers want? To overturn Karadzic's conviction and for the judges to order a re-run of the trial. What happens after the judges rule? The ruling by the judges on Wednesday will be final and can not be appealed. The ruling will end one of the highest profile legal battles stemming from the Balkan wars. "I think [the wounds] are still wide open in Bosnia, I think it's very depressing," said Roberts. "Over twenty year after the end of the war in Bosnia, there's still serious ethnic tensions in Bosnia between the Serbs on one side and the Croats and Muslims as well. Look back on the Second World War- twenty years after the Second World War, Germany was integrated into the Western alliance. Here we are twenty years on and there's still the same bitterness, there's still the same tension. I think Bosnia's essentially a failed country which requires constant nursing by the international community so it's not going to fall back into total chaos again." Radovan Karadzic "The Butcher of Bosnia"